It might cover well-trodden ground, but Digi's electric piano plug-in is polished and flexible enough to merit its release. Crucially, it also sounds awesomely realistic. Stunning sonic realism. A real player's instrument. Effects with balls. Many useful presets. No standalone version. Some slow loading times. RTAS-only. It's true that Digidesign were slow off the blocks when it came to developing virtual instruments for Pro Tools. There's no stopping them now though: we've already seen the likes of Strike (a virtual drummer) and Hybrid (a soft synth), and Structure (their software sampler) will be with us soon. For now, though, we have Velvet, an RTAS instrument that can be used in any Pro Tools 7 software (HD, LE or M-Powered) and also be hosted by any other DAW that supports the RTAS format, eg, MOTU's Digital Performer. 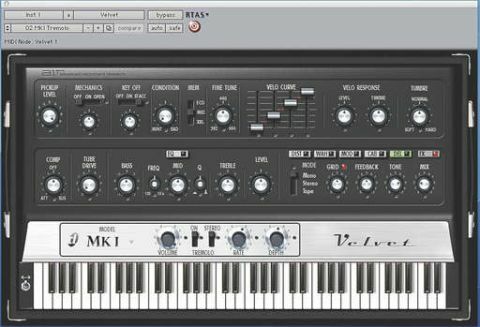 Velvet emulates four of the most popular electric pianos in history: Fender's Mk1, Mk2 and Suitcase 73 Rhodes models, and the Wurlitzer A200. It uses what Digi call 'dynamic modelling', which promises to merge the best aspects of sampling and modelling to create an instrument that sounds superior and is responsive to the touch. Judging by the 300MB data file and the time it takes to load each model, we suspect a fair amount of sampling is used as a foundation before any modelling takes place. To cut straight to the chase, Velvet does the business on many levels. All four models sound as good as you'd hope and could only be bettered by the original instruments. Those who've played the originals will obviously miss their unique characteristics, but Velvet's emulations are certainly on the money. The sound of each model is startlingly true, and the changes in tone through the velocity layers are uncannily realistic. The level of control takes this realism a stage further: you can change the level of mechanical noise from the hammers and even set the condition of the instrument from 'mint' through to 'bad'. The effects section adds to Velvet's appeal and, pleasingly, is far from polite. The Distortion, Wah, Tube Drive and Cab processors are all edgy and hugely variable, while the delay and modulation effects offer Size, Depth, Warmth and Weirdness options. The parametric EQ, meanwhile, easily sorts out any tonal issues. And of course, no electric piano plug-in would be complete without a stereo tremolo; this lets you recreate that idiosyncratic wobble and can be placed before or after the rest of the effects chain. The sound and range of tones alone make this a very special instrument that, because of its expressive capabilities, will hold particular appeal for 'proper' players. Useful selections of presets for each of the four models amply illustrate Velvet's versatility, and the excellent performance-controlled effects only add to its allure. A sure-fire winner.